For more than 30 years Grafton has been delivering first class permanent recruitment services across all sectors. Whether it’s for large multinationals, SMEs, or a public sector organisation our focus is on providing individual and professional care for our clients. Recruiting permanent employees is often a lengthy, risky, time consuming and expensive process. With increasing numbers of candidates available for certain positions the number of applications that clients receive may be overwhelming, causing uncertainty and huge volumes of administrative work around screening, matching and processing applications. In contrast, a client may be searching for an extremely specialised skill sets and may not know where to find or how much to pay for those skills. Last year we partnered with our clients to provide over 2,000 permanent employees across a wide range of sectors and job categories including; Sales and Marketing, Retail, Administration and Customer Support to specialist professional skills in areas such as Accountancy, Banking, Funds, Technology, Transport and Logistics, Engineering, Multilingual and Scientific. Our dedicated Specialist Recruitment Team use their niche industry insight and market knowledge to ensure that your critical or hard to fill vacancies are filled on time and on budget whilst delivering the highest quality service. 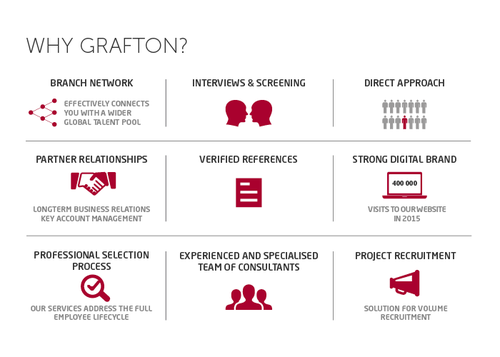 At Grafton we have a proven track record in completing large volume recruitment projects. Typically our volume recruitment solutions are for clients with diverse hiring needs or a requirement for numerous staff performing similar roles in a specific timeframe. Whatever your needs, whatever your timeline, Grafton can deliver. We will work in partnership with you to plan, execute and administer a bespoke recruitment model, which can include talent attraction, employer branding, assessment and selection, onboarding and managed services. International Candidate Mobility is a new service from Grafton that supports our clients in situations where there are shortages of skills and competencies in local labour markets. Through our connected network, geographic footprint and digital search methods we effectively connect you to European and Global talent pools to acquire the specialist talent you require to drive your business forward. Our network of skilled recruitment consultants and researchers employ the latest techniques in both on and offline research to carry out advanced candidate searches. We are experts in placing Executives, Managers and Professionals and use our considerable market knowledge to target professionals who are not actively seeking new jobs or applying to job advertisements.